Although designer stubble may look good on my favourite male celebs, I prefer my own man’s face to be clean shaven and beautifully soft. This Christmas I’m going to pamper him with the L’Occitane shaving essentials gift set which includes Cade shaving cream and aftershave balm. I know he’ll secretly love having some luxury skincare products of his own – he steals mine often enough! The Cade range is based on cade essential oil to purify and stimulate as well as protecting shea butter, moisturising vegetable-based glycerine, soothing bisabolol and firming extract of birch sap. The shaving oil softens the hair for an easier shave and reduces irritation and redness and the after shave balm helps to soothe the skin after shaving. 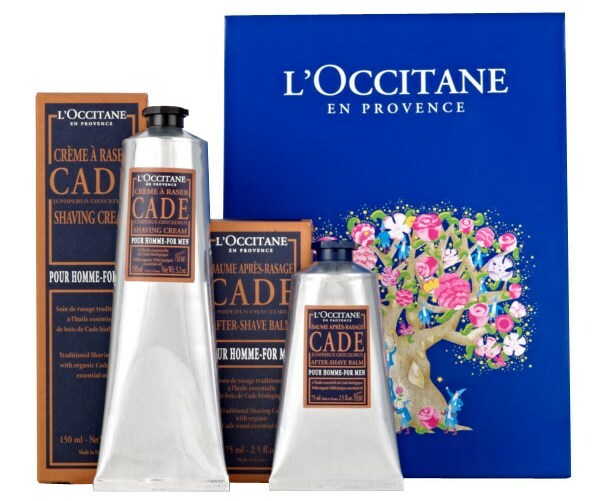 You can also buy products from the Cade range as a lovely boxed gift set perfect for Christmas. The shaving essentials gift costs £34.50 and includes Cade shaving cream and aftershave balm. Do the men in your life secretly steal your beauty products too?